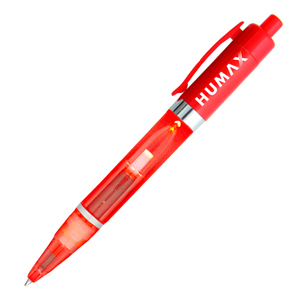 If you're in the dark and need to write, our light up pen with LED light are a light pen must have! Write day or night when you have one of these snazzy light up pens. Get that special someone's phone number in any lighting with ease using these light up pens! They are definitely a must and will never disappoint at any event. LED lights up in the barrel in red light and has black ink. Our light up pens has infinite uses: take them to the bar, camping, school and more!